If a portable electric power washer just doesn’t quite blast it for you, then you’re probably on the right page! Heavy duty stubborn cleaning jobs may require the best petrol power washer as this is able to produce much more power than an electric powered one. 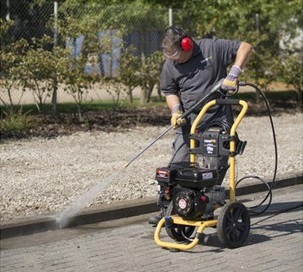 Whether you need it for cleaning your standard garden furniture such as your garden picnic table or cleaning more heavy duty items such as lorries & tractors, a petrol power washer will be able to handle these tasks with relative ease. However, for smaller garden cleaning chores, you might be better off with an electric powered model. Yes, usually a petrol power washer does come at a higher cost, however, a lower end model can still be bought for cheaper than a high end electric pressure washer. In addition, the former will still be more powerful, but as with anything, it also has its disadvantages. 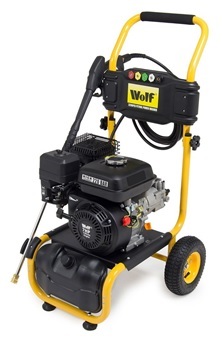 Powerful Wolf 6.5HP 4 stroke petrol driven engine. Produces up to 200 BAR which is 3000 psi of pressure. Includes heavy duty lance with 4 quick fit nozzles (pencil jet, high pressure, fan jet & soap nozzle. Weighs 37kg which means it can’t easily be accidently pulled or tilted over. 6m long hose length but a longer hose length can be purchased separately. Strong durable steel frame with 8” all terrain wheels for easy transportation. Oil cap positioning is in quite an awkward position access. 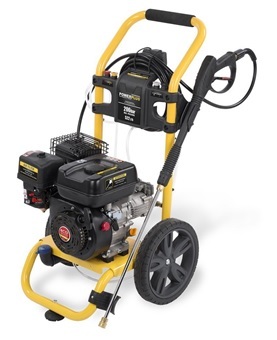 Very reasonably priced for a petrol pressure washer 3000 psi, that means it can produce nearly twice as much pressure as most electric powered pressure washers. Tackling any cleaning chore shouldn’t cause any difficulty. Furthermore, since it’s powered by petrol, you’re not restricted by a power cord. Should anything go wrong with this machine, you can put your mind at ease, as it’s covered by a 2 year manufacturer’s warranty. Powered by a 6.5HP 4 stroke engine. Maximum pressure of 3100 psi. 5 different spray settings to choose from, each designed for different tasks. Solid frame with large wheels for easy mobility. Generous 8m long wire reinforced hose to easily reach all areas. Covered by a 2 year manufacturer’s warranty. Wheels are not as smooth over all types of terrain. This Parker petrol powered pressure washer is slightly more powerful than the former, and has a longer 8m reinforced hose to offer more flexibility. Since it only weighs 25kg and benefits from large wheels, maneuvering this around can be done relatively easy. Quiet but powerful 87cc 3.6HP 4 stroke engine. Maximum pressure output of 1950 psi or 134 bar. Compact model weighing only 19kg offers more portability. 5m hose length with 5 different nozzle attachments. Includes 12 months domestic use warranty. Can be quite heavy to carry around as there are no wheels attached. Most petrol power washers are quite big in size and won’t fit inside the boot of your car, but, not the Wilks-USA TX460. 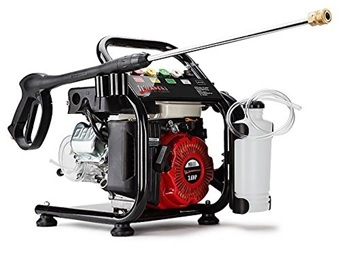 Ideal for trips away, camping and home use, this portable petrol pressure washer still packs a powerful punch of up to 1950 psi despite its size. Cordless electric powered pressure washers just don’t offer the same kind of power as corded electric models, but, with the Wilks-USA TX460, you’re not limited by a cord or power. It’s still more powerful than most corded models. 5HP powered 4 stroke petrol engine. Produces 220 BAR (3200 psi) of pressure. Delivers up to 540L of water per hour. Equipped with a heavy duty lance and a choice of 5 nozzles. All terrain wheels makes manoeuvring the petrol power washer a lot easier. Supported by a strong steel chassis which also protects the main components. Standard hose length is quite short, but you can purchase an extender. The most powerful petrol power washer on the list, based on its ability to produce up to 3200 psi. 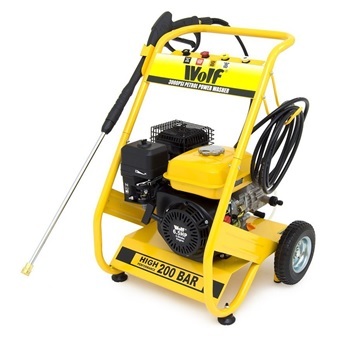 However, if the extra power is not necessary, our best petrol power washer which is the Wolf 200 Bar, is only a tad weaker, but will save you nearly £100. On the other hand, if extra power is needed, then this model will give you that extra little boost you might just need. Low fuel consumption 180cc 4 stroke eco drive petrol engine. 206 BAR / 3060 psi maximum pressure output. Heavy duty lance with 4 quick fit nozzles. Strong protective steel frame with hose storage and detergent tank. Long 3 year warranty for home use only. Brand new replacement parts may be more difficult to get hold of, you may be supplied with second hand replacement parts should you require any. 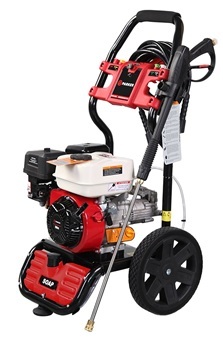 Slightly more powerful than a 3000 psi pressure washer is the PowerPlus 206 bar pressure washer. Well built and supported by a strong steel frame, hence why the overall weight is 31kg, however, the all terrain wheels means moving this around should be very easy. Backed by a 3 year warranty if it’s going to be used for home use only. 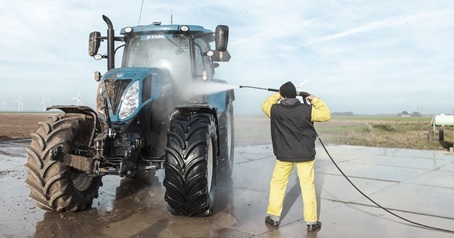 When it comes to buying a power washer, for many people they’ve considered whether they need a petrol or electric powered model, but, they may still be left undecided after browsing a few models. For those people, we’ve outlined a list of pros and cons of each one as you can see below. Completes cleaning jobs in a much quicker time. Suitable for domestic as well agriculture or industrial use. Runs on petrol, therefore, there’s no cord attached offering more mobility. Designed for regular and prolonged use. Not everyone will know how to add fuel. Larger and heavier, resulting in a need for more storage space. Can be quite noisy when in operation. Perfect for domestic home use. Corded or cordless models available to choose from. Starting price is a lot lower. Generally lighter and easier to carry around. Easy to maintain and much quieter. More attachments to choose from or purchase. Lacks power for bigger and dirtier cleaning chores. Corded models mean you’re limited to how far you can go from the plug socket. Now that we’ve gone through the list of the best petrol power washer reviews and weighed up the pros and cons of buying one, it’s time to decide whether a petrol powered power washer is the right choice for you. First of all, the right choice will largely depend on what you will be needing to use it for. If it’s purely for domestic use such as cleaning garden furniture and equipment, then an electric powered model would be ideal. However, for heavy duty cleaning chores such agriculture or industrial use or cleaning chores where a plug socket isn’t available such as for camping trips, then a petrol powered model would probably be more ideal.